Build your own virtual model railway and watch it come to life in stunning 3D. No other software makes it as easy to create your own highly detailed tracks, stations, tunnels, towns, roads, level crossings and scenery. Ideal for railway enthusiasts of all ages, the only limit is your imagination! 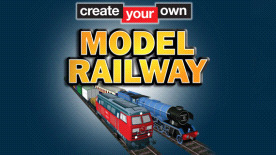 Create your own model railway in minutes!